Jara with her parents, Jerome and Joan Settles. In this issue we asked Jara Settles, a long time exhibitor, committee member, and volunteer of the American Royal to share some of her history with the American Royal, her favorite memories and experiences, and why she thinks others should take advantage of the opportunity to get involved. Q. What is your connection to the American Royal? 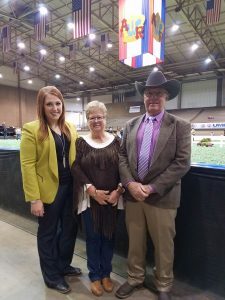 Jara: I started attending the Royal when I was quite young, tagging along with my parents when they came down from Nebraska to exhibit open class cattle and help junior exhibitors with their show heifers and steers that were purchased from our ranch. When I was old enough to show, I exhibited purebred breeding cattle at the Royal every year. When I was in college, I competed in the livestock judging contests and was fortunate to be selected as a Royal Scholar. Now, I am an attorney at Shook, Hardy & Bacon LLP here in Kansas City. My firm is extremely supportive of the Royal and I maintain my involvement with the organization by volunteering, serving on the calf scramble committee, and helping exhibitors. Q. How long have you been involved with the American Royal? Jara: Nearly all my life! Q. What is your favorite event? Jara: No question, the livestock shows. Friends and family from across the nation come for this event and, for two weeks while livestock fill the Royal complex, our home is bursting with loved ones who are excited to experience the American Royal. Q. Do you have a favorite memory from your experiences at the American Royal? Jara: I have a lifetime of wonderful memories at the Royal. I’ve experienced individual and team successes there and I now have the privilege of helping younger showmen achieve their own dreams. I think this year’s American Royal will be hard to top as my dad and I had the opportunity to judge the Shorthorn and Limousin shows at the same in the show rings right next to each other. To be asked, as a young woman in a male-dominated trade, to articulate my preferences and opinions right next to the person who taught me so much about the industry I love was pretty special. Q. Why should others get involved with the American Royal? Jara: Giving of your time and resources to the American Royal is an investment in agriculture, the youth of our country, and the future of Kansas City. The ability to bring together different viewpoints and backgrounds to compete and learn constructively is what truly makes the Royal special and what develops future leaders. Because volunteers and donors channeled their efforts toward the Royal, a little girl from rural Nebraska worked hard, succeeded, and left the farm to experience a diverse and wonderful world while helping to pay for her college education. Because of that life-long investment, because of what the American Royal continues to do, and because of the open arms with which I was received, Kansas City truly feels like home.